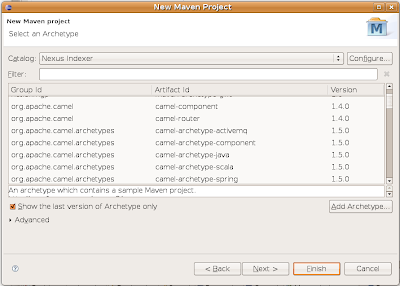 I just noticed today that Apache Camel shows up by default in the m2eclipse New Maven Project dialog. No extra fooling around is required anymore. Very cool! This is by far the easiest way to get started with Apache Camel - you don't even have to leave your IDE. Cool. Glad to see its there Jon now that you did the effort in the first place to get us there. How do you use your Apache Camel?